God's Healing Mercy Blog — Kathleen Beckman, L.H.S. Spending many hours in Eucharistic adoration, she received messages from the Lord regarding the priesthood. These are Church approved, and quoted in the Congregation for the Clergy’s booklet on priestly holiness and spiritual maternity. Venerable Conchita’s messages are also widely published in books. Spiritual maternity of clergy has historical tradition in the Church and is well articulated in the Congregation for the Clergy’s publications (2007, 2013). Why spiritual motherhood? Motherhood of souls, especially of clergy souls, distinguishes itself by the essence of the term “mother” which denotes one who labors to gives birth. God invites women to labor spiritually to birth grace in the souls and ministry of Christ’s ordained ministers. The Lord revealed to Conchita the vital role of the priesthood for the world, and the need for spiritual motherhood of priests. “There are souls, who through ordination receive a priestly anointing. However, there are also priestly souls who do not have the dignity or the ordination of a priest, yet have a priestly mission. They offer themselves united to me…. These souls help the Church in a very powerful spiritual way…. You will be the mother of a great number of spiritual children, yet they will cost your heart the death of a thousand martyrs. Conchita’s Eucharistic life was exemplary. Ardent prayer and generous sacrifice for the holiness of priests was the fruit of her Eucharistic union with the Eternal High Priest. To pray for the holiness and protection of priests, and for the fruitfulness of their ministry is to pray as Mary prayed; live Eucharistically as did Mary. Rooted in the family, grounded by the cross, fixed on the Eucharist, Conchita’s life was ordinary in the way that ordinary life is abundant with Christ. Here’s a note from her spiritual diary that reveals how ordinary family life is a catalyst for communion with Christ who makes all things possible. Spiritual Mother to Priests: ‘Bring yourself as an offering for the priests. Unite your offering with my offering, to obtain graces for them…. I want to come again into this world … in my priests. I want to renew the world by revealing myself through the priests. “The Lord told me: ‘The world is buried in sensuality, no longer is sacrifice loved and no longer is its sweetness known. I wish the Cross to reign, today it is presented to the world with My Heart, so that it may bring souls to make sacrifices. No true love is without sacrifice. It is only in My crucified Heart that the ineffable sweetness of My Heart can be tasted. Seen from the outside, the Cross is bitter and harsh, but as soon as tasted, penetrating and savoring it, there is no greater pleasure. Therein is the repose of the souls, the sole inebriated by love, therein its delight, its life’” (Auto. 1,216-218). In May 2019, in Mexico City, when Venerable Conchita is beatified as ordained by Pope Francis, let us pray for “a new Pentecost through the Cross”. Melchizedek is the first priest mentioned in the Hebrew Bible, "... Melchizedek, who was king of Salem and also a priest of the Most High God." — Genesis 14:18. Jesus is referred to as "a priest forever, according to the order of Melchizedek" in Psalm 110. Jesus says to Peter, "And so I tell you, Peter: you are a rock, and on this rock foundation I will build my church, and not even death will ever be able to overcome it." — Mathew 16:18. Not even death will overcome the Church, but that doesn't mean the Church will always be healthy. Today's priests are the descendancy of this divine order. While they are not perfect, priests serve us, Jesus' disciples, Jesus' Church. Praying for priests is praying for the Body of Christ and we are the Body of Christ. We are Church. That's why it's so important to pray for our priests worldwide. Saint Peter wasn't perfect, neither were any of the saints, yet they are saints. Priests aren't perfect, but they do strive to be saintly - it's part of their training at the seminary. Let us now pray for our priests and those people affected by any scandals with the new ROSARY OF REPARATION AND HEALING from the Foundation of Prayer for Priests. This downloadable Rosary pamphlet contains The Sorrowful Mysteries as 'A Prayerful Response to Clergy Scandals'. 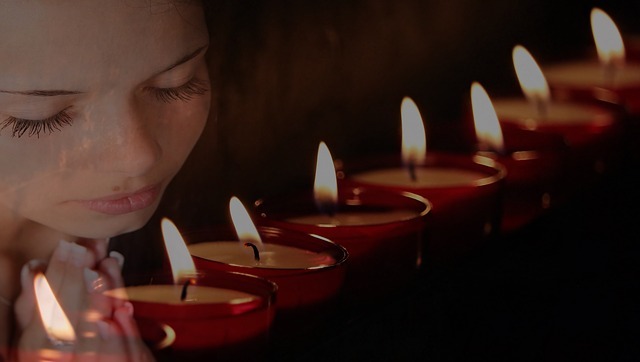 You'll find meditations, reflections and petitions for each decade to help focus our prayers on healing and reparation. You can download and print this three-fold ROSARY OF REPARATION AND HEALING pamphlet by clicking the image below. Kathleen Beckman and The Foundation of Prayer for Priests would like to urge our readers to share this Blog along with the ROSARY OF REPARATION AND HEALING pamphlet. Let's turn this into a "Campaign of Prayer for Reparation and Healing". Contact your family, friends, colleagues, fellow Christians and Christian wannabees. Send emails, post on Facebook, share on Twitter, write a Blog, upload a video to YouTube. There are billions of Christians worldwide - how many can we reach? Also, we can enter into Family Prayer times, and form Prayer Groups to meet for 'Adoration Thursdays for Priests'. We can even 'Spiritually Adopt a Priest' and pray with them and for them. Please, also consider becoming a member of the Foundation of Prayer for Priests and you'll receive Newsletters from The Foundation of Prayer for Priests as they are released. The Newsletters keep members informed with ongoing and upcoming events, announcements and additions to the Foundation of Prayer for Priests website. Thank you all for your prayers, participation and sharing. As of today, our bishops will be spending the next seven days in a retreat at Mundelein Seminary in Chicago and the faithful are being asked to join them by devoting the next week to intercessory prayer and sacrifices on their behalf. While they are gathered at this retreat, the faithful are being asked to commit to offering intercessory prayer and sacrifices during these seven days. “The Catechism of the Catholic Church defines intercessory prayer as ‘a prayer of petition which leads us to pray as Jesus did’ (CCC 281-283). Though He is the ‘one intercessor with the Father on behalf of all men,’ we can be united with him in this form of prayer,” the FPP instructs. January 2, 2019: Eternal Father, grant that bishops will take ample time to pray, letting the Lord speak to them in adoration. Grant them listening hearts that hear in the silence of divine love. January 3, 2019: Eternal Father, grant that bishops express contrition for mistakes they and/or brother bishops, past and present, may have made. Graciously lead them into the pierced heart of Jesus on the Cross. January 4, 2019: Eternal Father, grant that bishops thank the Lord for their vocation, remembering why they believed they were called to the priesthood; enlighten their memory; enkindle their hearts with joy for service. January 5, 2019: Eternal Father, grant that bishops ardently pray for the victims/survivors of sexual abuse. Graciously grant them renewed compassion and inspiration on how provide healing. January 6, 2019: Eternal Father, grant that bishops pray for the holiness of life of bishops, priests, and deacons. Confirm them in the evangelical counsels. January 7, 2019: Eternal Father, grant that bishops pray fervently for the protection of the Church in the United States and in the world. Grant them a renewed spirit of wisdom and discernment. January 8, 2019: Eternal Father, grant that bishops pray for all the presidents of conferences of bishops throughout the world who are preparing for the late February gathering in Rome to discuss the Church’s response to the abuse of minors. Graciously strengthen bishops for the task set before them. Lord Jesus Christ, eternal High Priest, you offered yourself to the Father on the altar of the cross and through the outpouring of the Holy Spirit gave your priestly people a share in your redeeming sacrifice. Hear our prayer for the sanctification of our priests. Grant that all who are ordained to the ministerial priesthood may be ever more conformed to you, the Divine Master. May they preach the Gospel with pure heart and clear conscience. Let them be shepherds according to your own heart, single-minded in service to you and to the Church, and shining examples of a holy, simple, and joyful life. Through the prayers of the Blessed Virgin Mary, your Mother and ours, draw all priests and the flocks entrusted to their care to the fullness of eternal life where you live and reign with the Father and the Holy Spirit, one God, for ever and ever. Amen. Please join in this important campaign! To register, email: info@foundationforpriests.org and type, “I’ll join the Mantle of Prayer Campaign.” In the email, please feel free to share the “spiritual bouquet” that you or your group will offer for bishops. You may also register by clicking > “subscribe”. Thank you for your devotions and prayers for all our Priests and Bishops. Author’s note: These reflections are slightly edited and reprinted from the book, Praying for Priests: A Mission or the New Evangelization, which available from Sophia Institute Press. It is a blessing to contemplate Mary during Advent: her yes to the divine will at the Annunciation, her miraculous pregnancy, the silence of her heart, the peace of her mind, the humility of her spirit, the richness of her interior life, the courage of her waiting, her obedience of faith, servant attitude, youthful beauty, perfect innocence, and wealth of Heavenly wisdom. In these precious, passing hours of the beautiful season of Advent, I am not alone; Mary is near. With her divine pregnancy, her immaculate heart swells with grateful love. The unborn Christ Child is nestled in her virginal womb. His heartbeat echoes in hers; a song of glorious joy resounds in Mother and Child. Their union is also for me, for all believers. Their bond of love creates a home for me, and for you. My Advent reflection on Mary includes another facet and gift of hers. She is fierce in crushing the head of the Serpent, and in protecting God’s children from demons. Those who work in the Church’s ministry of healing, deliverance and exorcism have witnessed, on numerous occasions, that the Virgin Mary’s presence is made known during exorcisms. She is called upon by the priest exorcist, in the formal prayers of the major Rite, and in the holy rosary that is prayed among other prayers during the exorcism. There are manifestations of evil spirits that are ugly and strange during exorcisms. Also, there are powerful, peaceful, beautiful manifestations of the presence of Mary, angels and saints. During Advent and Christmas seasons when we reverence Mary’s yes to God and her divine pregnancy, let us remember that the unprecedented, monumental grace of the Incarnation of the Word of God set in motion the defeat of Satan and a great spiritual battle. For ongoing formation in the ministry of deliverance and exorcism, I attended the 12th Course on Exorcism and Prayers of Liberation at the Pontifical Regina Apostolorum University in Rome in May 2017. The Association of International Exorcists (AIE) coordinated the course and Fr. Francesco Bamonte, a member of the Institute of the Servants of the Immaculate Heart of Mary and AIE president, lectured. Here, I share Fr. Bamonte’s testimonies regarding the Virgin Mary crushing the Serpent. I was moved to deeper certitude in Mary’s role in the fight against evil by Fr. Bamonte’s witness. The Woman of waiting, of hope, the Women dressed with the sun, most sweet Mother. The Woman! For love of His children, she was created before all times in the thought of God. And as a pure spirit, I cannot bear this. That putrid flesh! She is feared by us because she holds you in her arms with her humility, obedience, and merciful love. The purity of her body: it was not ever touched, not even by a thought. We did not succeed, not even with a thought. I did not undermine her even with a thought—not one, cursed! I was never able to touch her because That One always watched over her. There was always That One. It is not my fault. I was not able to touch her. I was afraid. Another time I head these phrases: “I will not tolerate that she be next to Him and over me. I was the most beautiful angel, beautiful, beautiful, and the greatest, great, great. I was Lucifer, the angel par excellence. What an affront! What an affront! To conceive without sin one of you! What an affront! The Immaculate One is the greatest insult of your God to us. To have one of you conceived without that sin that we created is an intolerable offense. We marked all with our sign. All, except her! He should not have done that to us! One of you without sin! And then He incarnates Himself in your disgusting body made of worms (here I think the demon was describing the decomposition of our bodies after death). Why did he do it? To ruin us? Why did He humiliate us so much? These few examples from an exorcist priest remind us that we have an enemy who quite literally hates us because we are marked with the sign of God on our forehead. Through baptism we are possessed by God; claimed for Christ. When a diabolically possessed person seeks liberation, the exorcist reclaims he or she for God since the person had given a claim (invitation) to Satan and rejected Christ. When we reject God, we reject our identity as a child of God. This makes us vulnerable to identify with darkness, rather than light; with falsehood, rather than truth. We can ask Mary to help us to renounce any agreement we have with darkness or falsehood. What fascinates us? To what is our heart drawn? Satan seductively desires our attention away from the things of God. We can ask the Holy Spirit to consecrate us in the truth of God’s love. Mary helps us to resist the false promises of Satan. She aids us in remaining connected to God. Mary takes us into her maternal heart that is a holy fortress, impenetrable by demons—but only with our permission. Advent and Christmas season abound with grace, beauty, joy and peace. Spiritual warfare is also present—blatant or subtle temptations or manifestations of evil. Today’s culture shouts anti-Christian and demonic noise. Demonic messaging can be seeded into our homes through television and other media. Discern. The messaging of the world is not subliminal these days. Exorcists have recommended cleansing the home atmosphere by playing Gregorian Chant. It seems the devils are repulsed by it. Enter the listening silence of Mary’s world to hear and commune with our loving, merciful Lord. Communion with Christ brings us to the place of victory against the flesh, the world and the devil. In truth, the devils not only fear Mary, but also saints in the making. Prayer: Mother Mary, full of grace, fierce as an army in battle array, please protect me from evil. Kindly intercede for my interior transformation; that my fallen nature and weak virtue will be converted. Graciously lead me into your listening silence where the voice of the Beloved is heard that I may do whatever He tells me. Thank you, holy Mother, for loving me, and for leading me into the victory of Jesus Christ. Grant me the grace never to offend God, never to reject Him or myself, for I am marked with the sign of His cross and covered in His Precious Blood; to Him alone do I belong. Amen. “This is not about me. My vocation story is all about God.” These words of Bishop Michael C. Barber, S.J., were spoken at a Magnificat Prayer Breakfast that I attended in Oakland, California. His testimony, along with nineteen other clergy is now published in a new book titled, Holy Orders: A Collection of Inspiring Clergy Testimonies. Bishop Barber’s vocation story is filled with surprising twists and turns in a tumultuous time of the Church. He was faithful to what the Lord asked along the sometimes-confusing way. In the end, he was ordained into the Order of St. Ignatius and St. Xavier. We flew to the Middle East, and the war began shortly thereafter, when the U.S. invaded Iraq in March 2003. It was one of the best times of my life as a priest. I was needed! We were on the Kuwait side of the Iraq border. I had my own convoy to attend to the soldiers who were dug in along the border preparing to invade. When I arrived, the men stopped their war plans. The colonel gathered everyone together. “I am a Catholic priest,” I said, “and I have been sent here. The battle will begin soon, and I would like to say Mass.” Everyone attended. “If it is not your time to die no bullet will find you,” I told them. “If it is your turn to die there is only one thing that will keep you from getting into heaven, and that is mortal sin. But we have the sacrament of Confession that can wash away any sin—any mortal sin. I will not leave this camp until everyone who wants to confess can.” There was a huge line. All the Marines—even the Protestants—came up and said, “I’m not a Catholic, but I have got to get this off my chest. Vocations to the ministerial priesthood, diaconate or consecrated life are central to life of the Church for the salvation of souls. It is the duty and privilege of the entire Church to intentionally pray for vocations, since it is a divine mandate: “He said to them, ‘The harvest is plentiful, but the laborers are few; therefore, ask the Lord of the harvest to send out laborers into his harvest’” (Luke 10:2). In my work for the Foundation of Prayer for Priests apostolate, and on Radio Maria programs, I interviewed several seminarians and priests. It’s fascinating to hear how God knocked on their heart, shook up their plans, stretched their imagination, and tugged on their soul to say “yes” to His call on their life. Their yes required Goliath courage, and a breathtaking leap of faith as evidenced in the following excerpts from the book. Holy Mother of Jesus, at the wedding feast at Cana, you prompted your Son to perform his first sign. Be with us as we discern our life’s work and guide us in the way we are called to follow in the footsteps of your Son. to send more laborers to the harvest in this land dedicated to your honor. Queen of Peace, Mirror of Justice, Health of the Sick, inspire vocations in our time. Let the word of your Son be made flesh anew in the lives of persons anxious to proclaim the good news of everlasting life. Amen. Author’s note: Magnificat, A Ministry to Catholic Women published Magnificat Proclaims: Holy Orders: A Collection of Inspiring Clergy Testimonies. The fifth objective of Magnificat is to imitate the Virgin Mary in her spiritual motherhood of priests. The book is available at www.magnificat-ministry.org or on Amazon. For more resources on vocations, priesthood, spiritual motherhood and fatherhood of clergy, visit www.foundationforpriests.org. We had a good plan. My mom and I would go to the hospital to visit my father, who was awaiting admission for a serious infection. In eighty-four years of life, he’d never been in a hospital. He’d been mom’s care-giver for the past few years. Two hours later, as I drove to my parent’s home, I tried to imagine that my younger brother’s “Mom is gone” did not mean she had died. I grabbed the rosary hanging from my rear-view mirror and began to pray. The Holy Spirit descended upon me with understanding: my mother had died that night. As I turned onto the familiar street where mom and dad had lived for sixty-four years, my eyes met the glare of flashing red lights from fire and police department vehicles parked in front of the home. I wedged my vehicle into the driveway, then ran past paramedics and police standing silently on the front porch, holding clipboards and filling out paperwork. Their eyes met mine, their glance sorrowful. No words were exchanged. My father, pulled from the hospital, three younger brothers, a sister-in-law and young niece were in the room. My mother was on the floor, covered in a blanket. I fell to the floor and uncovered her face so that I could kiss her goodbye. She was still warm. I was comforted by her familiar maternal warmth. I stroked her eighty-three-year-old face, now frozen in an expression of peace. From the depths of my soul, I wailed with cries of grief as my cheek rested on hers. My brother said, “We should pray the rosary for mom now. She’d like that.” We surrounded her lifeless body and prayed as we waited for the mortuary to remove her body. Mom was rarely left alone. My dad, siblings and a religious sister accompanied her and enabled her to live in the home that she filled with love. But she was alone when death visited suddenly. A heart attack. Another brother shared that when he found her, there was no sign of life, but he tried CPR. I was told that paramedics heroically tried to revive her for a long time. It was the Feast of the Visitation of Mary, a feast that has great meaning to me. I had just finished an EWTN “Women of Grace” webinar on “Spiritual Mothers: God’s Special Weapon Against Evil.” I never imagined that my foremost spiritual mother would die on this Marian feast. Intellectually, I anticipated my mother’s death from heart and lung disease. Emotionally, nothing could prepare me for the loss. Mother suffered physically over many years, but she loved life and cheerfully fought for it. God’s plan to call her into eternal life when she was alone at home was quite different than ours. We were left longing for one more conversation with a mother full of wisdom. We understood her sudden death was our loss but mother’s gain. 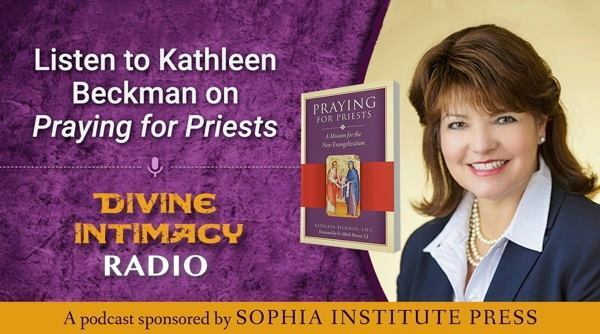 Divine Intimacy Radio Interviews Kathleen Beckman on "When Women Pray"
Divine Intimacy Radio, with Dan Burke and Melissa Elson, once again interview Kathleen Beckman. This time they chat about Kathleen's book, "When Women Pray: Eleven Womenon the Power of Prayer". Have you ever wondered how a busy mother can develop a strong prayer life, or does prayer affect one's physical and mental health, or is there a difference between how men and women pray? Listen and learn more about the power of a women's prayer by clicking the play button below. The Aleteia website has posted an article by Philip Kosloski describing a pious tradition involving amaniturgium. If you've had the privilege of attending the ordination of a priest, you may have witnessed this tradition. The mother of the newly ordained priest is presented with the linen towel (the maniturgium) used to wipe the sacred oil of anointment from the new priest's hands. The true reward is not the towel, but what the linen towel will obtain for the mother. Learn more by reading the article on the Aleteia website here. “Sacred Heart devotion isn’t our devotion. It’s God’s. It’s God’s devotion to us”, writes Fr. James Kubicki, S.J., in his book, A Heart on Fire. He also reminds us that the Sacred Heart devotion didn’t begin in the seventeenth century with revelations to a Visitation nun named St. Margaret Mary Alacoque—it began “before time, in the eternal Heart of God.” This truth aids the joyful rediscovery of God’s perfect love for us. God doesn’t need our love in return, but in the mystery of divine mercy, He desires our reciprocal love. God intends an abiding, loving communion with us. While our hearts are often fickle, forgetful and fearful, His heart is intently focused on us. In the present culture, so lacking in love, our concept of love is easily distorted, distracted, and destroyed. Devotion to the Sacred Heart of Jesus is a powerful provision against the destruction of authentic love. Christ is present, living and active and his Sacred Heart beats a love song that is uniquely personal. The devil, our ancient enemy (cf. Eph 6:11-13, Job 2:1-7, Zech 3:1-2, 1 Thes 2:18, Rev 12:10) methodically plots the crushing destruction of authentic love of God and neighbor. Diabolical temptation is aimed at the distortion of God’s image, distraction from our eternal goal, and the destruction of love. When the soul experiences the absence of authentic love, it readily succumbs to the seduction of diabolical liaisons. In the Church’s ministry of deliverance and exorcism we see this repeatedly. A heart on fire with and for divine love repels the demons. The Catechism addresses the reality of evil and our need to “fix our eyes of faith on him who alone is its conqueror”. 385 God is infinitely good and all his works are good. Yet no one can escape the experience of suffering or the evils in nature which seem to be linked to the limitations proper to creatures: and above all to the question of moral evil. Where does evil come from? “I sought whence evil comes and there was no solution”, said St. Augustine, and his own painful quest would only be resolved by his conversion to the living God. The revelation of divine love in Christ manifested at the same time the extent of evil and the superabundance of grace. We must therefore approach the question of the origin of evil by fixing the eyes of our faith on him who alone is its conqueror. When we fix our eyes and heart on the Sacred Heart of Jesus, we perceive that God’s heart is loving, omnipotent, omniscient, and protective of beloved creatures. The Sacred Heart burns with incomprehensible power to create good and destroy evil. Our focus is always the Eucharistic heart of God, not the work of the devil. Though we perceive the spiritual battle all around us, and discern well the spirits within and without, our hearts must commune with the Sacred Heart. During terrible temptations and worse diabolical onslaughts, the Sacred Heart is a refuge. Especially in Adoration, we can gaze, pray, converse, refresh, discern and be filled with the fuel of grace to resist the devil and proclaim Christ’s victory. I’d propose seven ways that devotion to the Sacred Heart protects us from sin and evil. War broke out in Heaven at the revelation of God’s plan for the Incarnation of the Word. The rebellion of one third of the angelic beings (now called demons), occurred because they would not accept that the Son of God would become “flesh” in the lowly form of a creature born of a “woman”. Devotion to the Sacred Heart cultivates incarnational love. Honoring the human heart of Jesus Christ, loving the Incarnate Word’s living heart, empowers us to imitate Him in loving the Father, self and others. This thwarts the devil’s plan to draw us away from our Creator with doubts that God is impersonal and disinterested. Our heart united to Christ’s heart becomes an impenetrable fortress. Demons may surround the fortress but they cannot enter. We enter the epic drama of the greatest love story ever through communion with Jesus in the Eucharist. Like the disciples on the road to Emmaus, we recognize Jesus in the breaking of the bread. Rekindling Eucharistic amazement is a term that Pope John Paul II used in his encyclical, “Ecclesia de Eucharistia.” This amazement of the human heart enkindles the fire of divine love within. Demons despise the Humble Host. 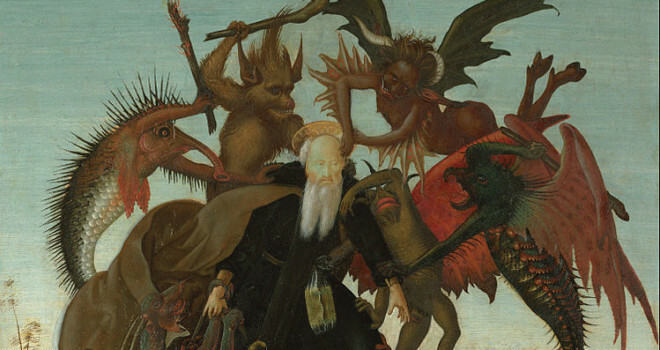 According to the saints, demons fear the disciples who live an intentional Eucharistic life. The Sacred Heart is the vessel from which flows the life-saving Precious Blood. The devil works tirelessly to keep us from Holy Communion. To the dismay of demons who curse, Eucharistic life forms a garment of praise that blesses. Jesus Christ Incarnate reveals the face and heart of our Father in Heaven. We desperately need this revelation of truth for knowledge of who we are: children of God. When we accept the revelation of Jesus Christ, we know our dignity and destiny. These ground us in the truth so that when the Liar, Deceiver and Thief assails us, we stand firm in the revelation of God’s mercy. Devotion to the Sacred Heart helps us to remember the revelation; the Gospel of love. The devil methodically plots to distract us from the revelation and its relevancy. When the devil tempts us to doubt God’s existence or insinuates that He is mean or punishing, we can fly unto the protection of the Sacred Heart, remembering the revelation of divine love. Knowing who God says that I am strengthens me to resist the devil’s lies. Pope Benedict reminded us, “We must never forget that all authentic and living Christian spirituality is based on the word of God proclaimed, accepted, celebrated, and meditated upon in the Church” (Verbum Domini, 121). From the beginning, the Word is love. The creation of mankind is deliberately orchestrated to draw all things to God wherein is the fulfillment of all desire. In the Scriptures, we read about Christ’s life on earth; His many human encounters where love manifested. His heart is touched, He weeps, heals, serves, sleeps, eats, prays—he understands men and women. This flies in the face of the devil who seeks to obliterate our awareness of the dignity given us by God. The Word has a heart of infinite love focused on you and me. The devil hates this reality because he exists in loneliness and alienation from love. The Sacred Heart is a heart for others. Father Simon Tugwell, O. P., teaches, “The liturgy, faithfully celebrated, should be a long-term course in heart-expansion, makes us more and more capable of the totality of love that there is in the heart of Christ.” The perfect sacrifice of Christ’s love is perpetuated on the altar. This is also the proclamation of His victory over evil. The devil, personified pride, is undone by the humility of Christ on the altar of sacrifice. Love sacrifices; lays down His life. The Sacred Heart radiates love that is aimed at the other; the poor, forgotten, sick, and grieving. His heart dies and rises for our sake. Proud and spiteful, the devils envy Christ’s power to save through sacrificial love. Whenever we love sacrificially, our spiritual armor is strengthened. “True devotion to the Sacred Heart depends on a proper understanding of reparation, an old theological term that is related to atonement, expiation, salvation, and redemption” writes Fr. Kubicki. In his “Jesus of Nazareth”, Pope Benedict XVI wrote, “God cannot simply ignore man’s disobedience and all the evil of history; he cannot treat it as if it were inconsequential or meaningless. Such ‘mercy’ would be that ‘cheap grace’ to which Bonhoeffer rightly objected in the face of the appalling evil encountered in his day.” Christ paid the debt of sinners. Sin continues. Believers can unite with Christ’s reparation and offer up our sufferings and sacrifices to help repair. Devotion to the Sacred Heart helps us to enter Christ’s reparative love. Thus, we reclaim territory, robbing the devil of so many souls that he’d carry to the abyss. The Church places the feast of the Sacred Heart on Friday and the feast of the Immaculate Heart on Saturday to reminds us their unity. Jesus Christ and His mother Mary are united in the will of the Father and they cannot be separated. Devotion and consecration to the Sacred Heart is spiritually complimentary to devotion to the Immaculate Heart. This holy liaison forms a powerhouse of protection against evil spirits. Between the Eucharistic Sacred Heart and the Virginal Immaculate Heart, there is a space reserved for you and me where no evil spirit dare to enter. Let us remain in the loving protection of the united Sacred and Immaculate Hearts where we are safe as we walk in the valley of death and evil. Enthronement of the family to the Sacred Heart of Jesus is highly recommended by priests. For more information about this, I highly recommend Fr. James Kubicki’s book, A Heart on Fire. Devotion affords spiritual benefits, for as Pope Benedict XVI wrote, “Our God is not a remote God intangible in his blessedness. Our God has a heart.” To whom does your heart belong?